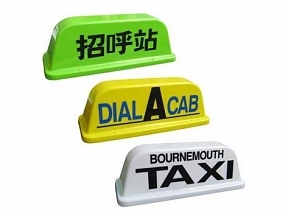 Taxi Magnetic Roof Log 18"
Manufactured from vacuum formed UV Stable acrylic. All Magnetic Roof Signs include rubber protective boots, these cover the powerful magnets to prevent scratching your paintwork. Please use the below calculator options to configure your requirements. * Illuminated option is supplied with a flexible cable with only a connector at the sign end, the other end has to be wired to a 12V dc supply and adequately fused by an auto electrician.